In 1984, Mark landed a job as an assistant at West Side Studios, London working with renowned production pair Clive Langer and Alan Winstanley who had great success producing Madness, Dexy's Midnight Runners, Lloyd Cole & the Commotions, Elvis Costello and later Bush. Mark's professional music career started as a drummer playing with Carlene Carter, Johnny Cash's stepdaughter, in 1982. The first time he went into a recording studio with her to record some demos, he was excited by the whole recording process and after the stint with Carlene finished in 1984, he landed a job as an assistant at West Side Studios, London working with renowned production pair Clive Langer and Alan Winstanley who had great success producing Madness, Dexy's Midnight Runners, Lloyd Cole & the Commotions, Elvis Costello and later Bush. In 1985, Mark engineered the hit record ‘Dancing In The Street’ by David Bowie & Mick Jagger. A year later, he became a freelance engineer and was discovered by Rhythm King, a label at the forefront of the British dance music. Working on a couple of Bomb The Bass mixes led to co-producing Neneh Cherry’s no.2 US billboard smash ‘Buffalo Stance’ & the subsequent seminal multi platinum album ‘Raw Like Sushi’. Following this he worked on a flood of pop/dance work for acts including Erasure, Depeche Mode, Lisa Stansfield & Yazz as well we Ian McCulloch, The Mission (UK), The Farm, The Heart Throbs, Texas & The Sugarcubes. 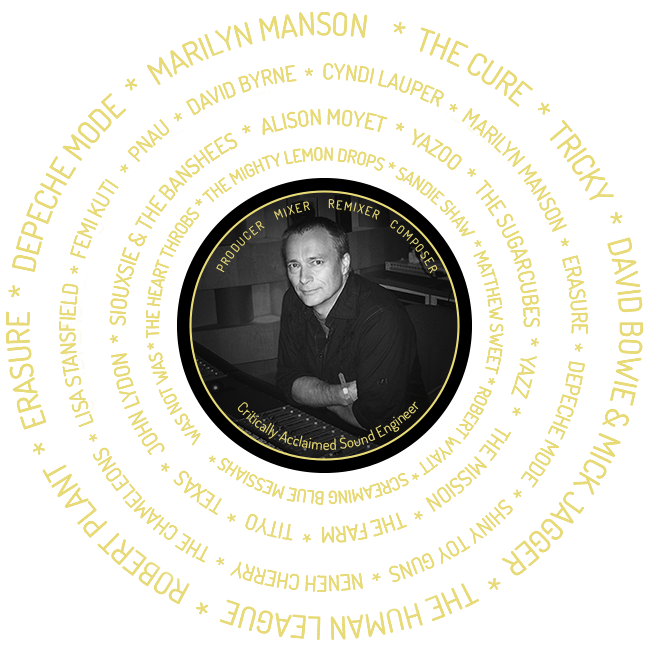 Robert Smith from The Cure, employed Mark's radio friendly skills to mix all singles from the album ‘Disintegration’. One of these ‘Lovesong’ is The Cure's highest charting single peaking #2 in the Billboard Top 100. Mark went on to work on further Cure albums - UK no1 ‘Wish’, ‘Mixed Up’ & 'Wild Mood Swings'. Tricky, a big fan of Marks work for the Cure, asked him to program, co-produce and mix his critically acclaimed debut album ‘Maxinquaye’ one of the definitive albums of the 90’s. This in turn led to Tricky fans John Lydon, David Byrne, Cathy Dennis and Cyndi Lauper hiring Mark to work on their albums. In 1996 Mark moved his studio to Hell's Kitchen NYC and side stepped into writing and producing music for big brand campaigns for companies such as Nike, Lowes, Reebok & Motorola although he continued to work on select artist projects for Erasure, Femi Kuti and Marilyn Manson (‘From Hell’ film sound track). While diversifying into TV/Film work Mark became an early adopter of the surround sound format and has been brought on board to consult, record and mix surround projects for PBS, EMI, David Byrne, film director Luc Besson as well as an exclusive project for Apple as part of a their major product release of Logic 8. Having worked on many commercially & critically acclaimed records as an engineer, producer & mixer Mark also steadily developed his writing skills. Co-writes have included with Cathy Dennis, PNAU, Kaz James (Bodyrockers) & Amalie Bruun.